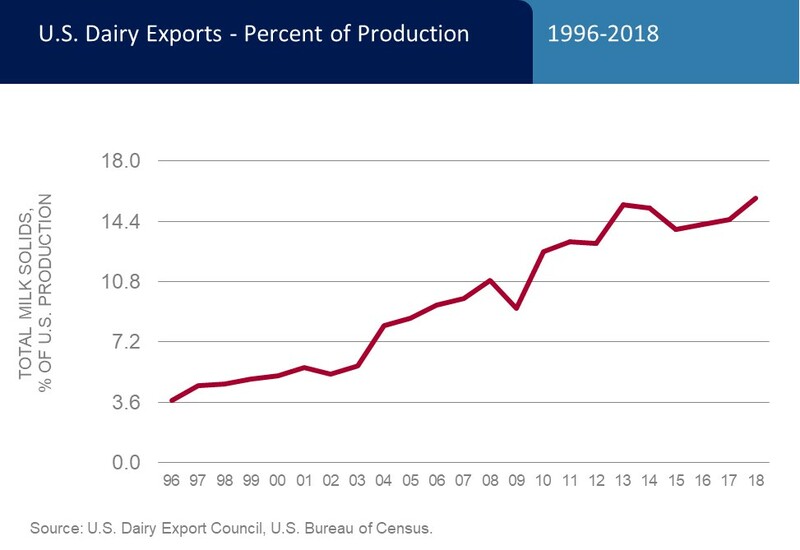 These downloadable graphs, tables and infographics help illustrate the U.S. dairy export story. Is there another visual you’d like to see? Contact Alan Levitt (alevitt@usdec.org, 703-528-3049) and we’ll add it to the collection. 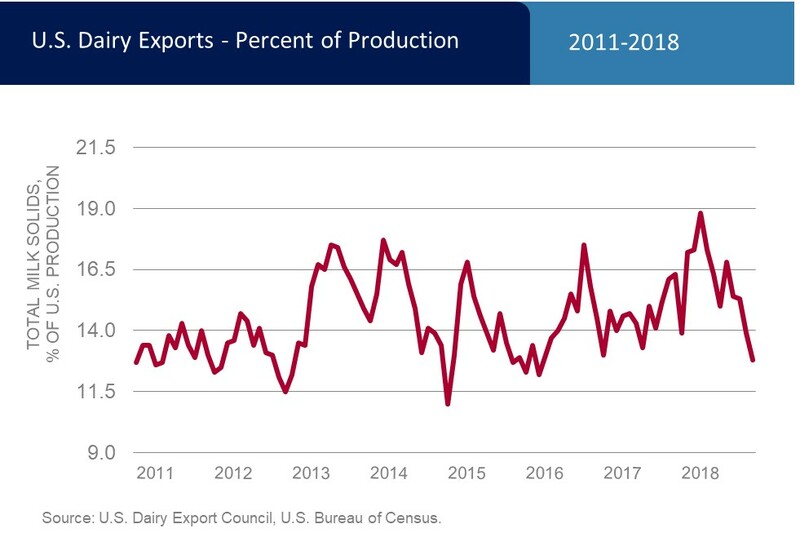 In 2018, exports were equivalent to 15.8 percent of U.S. milk production on a total milk solids basis, the highest figure ever. 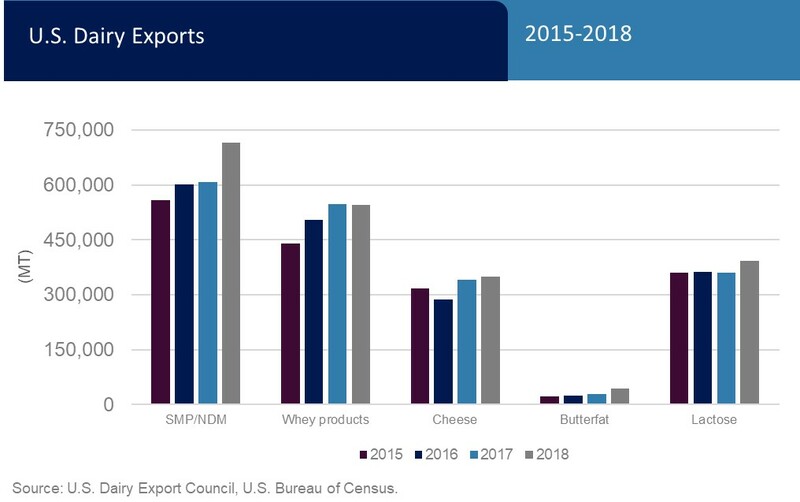 In December 2018, exports were equivalent to 12.8 percent of U.S. milk production on a total-milk-solids basis. For the full year, exports represented 15.8 percent of production. U.S. export volumes were an all-time high in 2018. On a value-basis, exports were the most in four years. Export volume was 4.39 billion lbs. of total milk solids, up 10 percent from the prior year. Export value finished at $5.59 billion, up 2 percent. 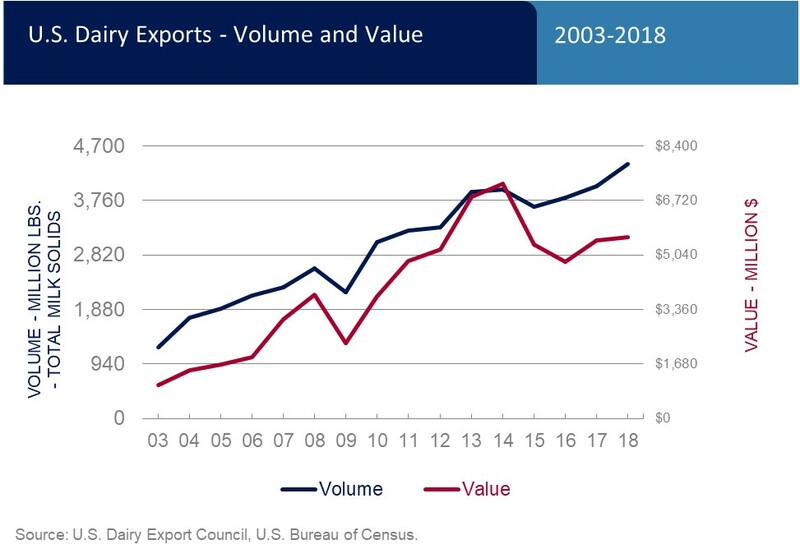 In 2018, U.S. dairy exports were valued at $5.585 billion, up 2 percent the prior year. 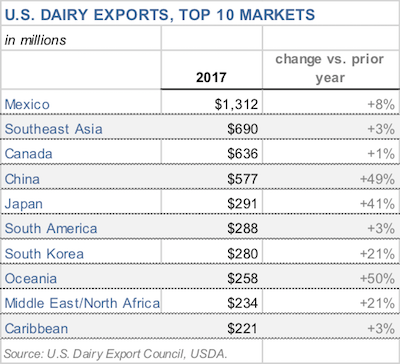 Mexico, Southeast Asia, Canada, China and South Korea account for almost two-thirds of U.S. dairy exports, by value. 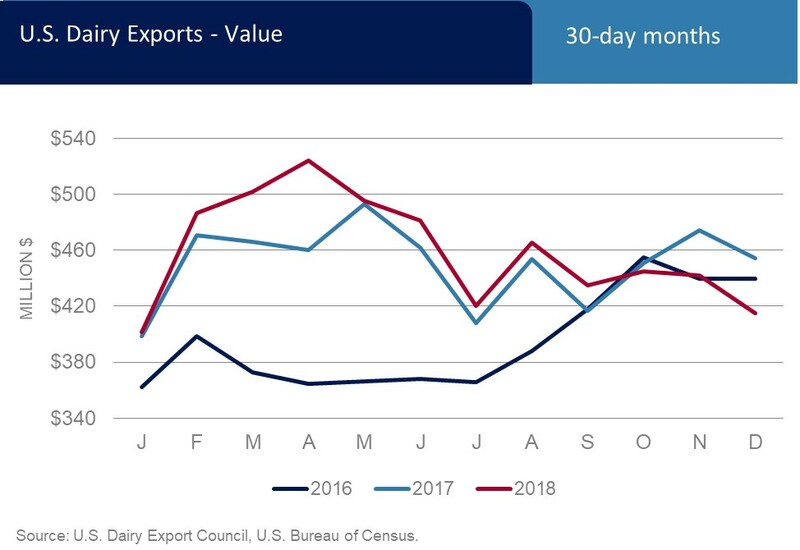 Overall dairy exports were $5.585 billion in 2018, up 2 percent from 2017. 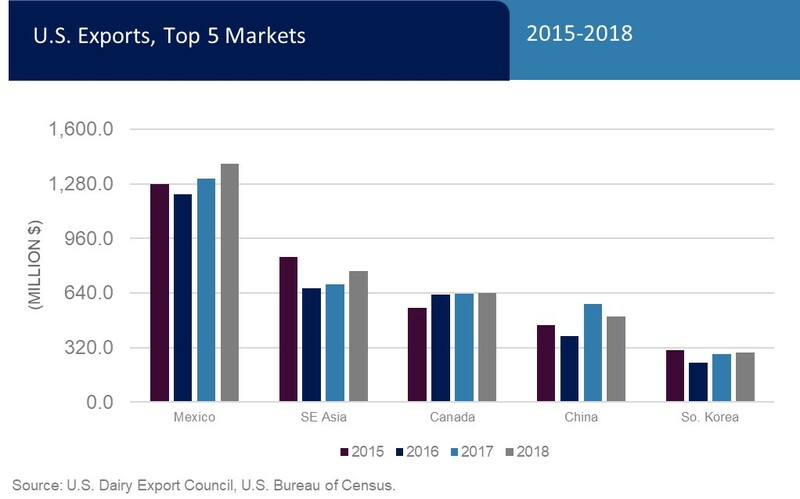 U.S. export volumes of SMP/NDM and lactose hit record highs in 2018. Cheese exports increased slightly, whey volumes were flat, and butterfat exports were significantly higher, though volumes remain small. 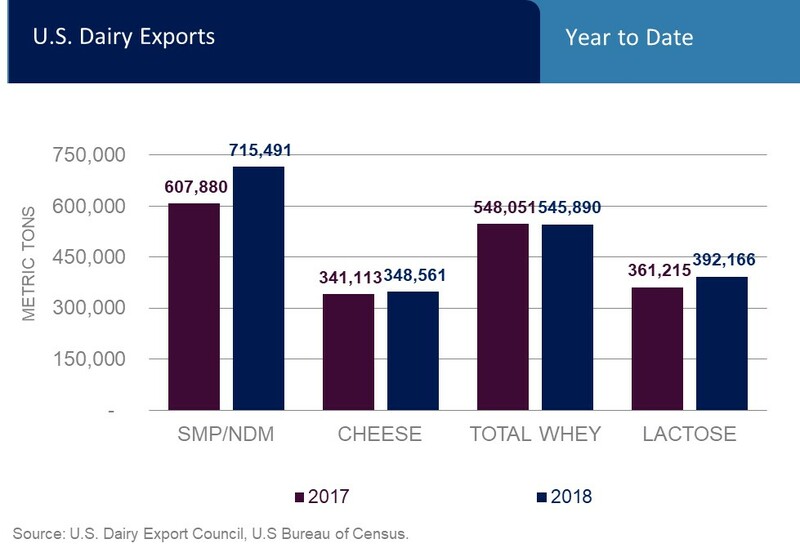 In 2018, SMP/NDM exports were up 18 percent, cheese exports were up 2 percent, whey exports were down fractionally, and lactose exports were up 9 percent.